Samsung is gearing up to release many devices this year and one right at the top of the list is the new Samsung Galaxy Note 3, yes there will be the S4 Mini, Active, and the Mega 6.3 looks promising, but we know the SGN3 will be the one to watch judging on past releases such as the Note 2. Even though the Samsung Galaxy Note 3 release is unknown many reports have come in (Such as Samsung executive J.K. Shin) suggesting it will be announced at the IFA 2013 event starting September 6th, but in the back of our minds we believe Samsung will hold its own special event like they did with the Broadway-like Samsung Galaxy S4. The Samsung Galaxy Note 3 will be going up against other big name smartphones, such as the Sony Xperia ZU also known as the ‘Ultra’, then there is the HTC Max to contend with, but one major phone will be the iPhone 6. Talking of the iPhone 6, we reported about this handset and Apple’s strategy in when they should release it. If Apple decides to skip the iPhone 5S, which is unlikely and move on ahead with the iPhone 6 this year, we believe this will be the biggest rival to the Samsung Galaxy Note 3. Samsung Galaxy Note 3 release & determination of rivalry depends on what releases at the same time, the iPhone 5 and Galaxy Note 2 released around about the same time and the only way Apple and Samsung can go head-to-head in the smartphone melee is for the iPhone 5S to be skipped in favour of the iPhone 6. Another factor to think about is the material used for the Samsung Galaxy Note 3, would you prefer plastic or metal? We will leave this one up to you. A few of the rumoured specs on the SGS3 so far include a 13MP camera, 5.9-inch full HD Super LCD3 display and a Snapdragon 800 SoC, but what is needed for sure is a removable battery and SD card, read more about this here. 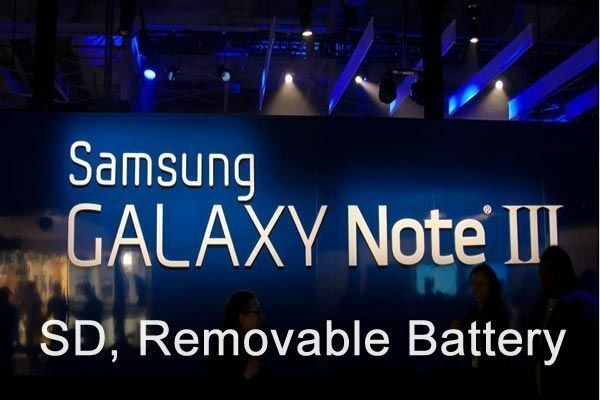 We have had many comments coming in about the Samsung Galaxy Note 3 and one reader said that they want minimum internal memory at 64GB with SD card with the same GB as well as a removable battery at 7100 mAH, now that is being optimistic, another reader said a 4200mAh battery is realistic. One reader commented about the SD Card and mentioned that if Samsung use a SDXC card you can drop in a 128GB version card. The Samsung Galaxy Note 3 when released this year will probably be one of the most sought after smartphones/phablets on the market, but they need to release at the right time to counter attack rivals. What are you expecting from the Samsung Galaxy Note 3? I had the Note, I have the Note 2 and love it, but if they make the Note 3 5.9 inches I will not be buying it. Too big…period. They will also alienate any female users. So no, I dont think it will be the most sought after device. You sound pretty clueless without any doubt. The Galaxy Note 2 is special to many women as well as men. This is the ultimate business productivity device and will sell better than the Note 2. It will certainly sell better than the Note 2 and will be THE Android flagship for 7 months or so. To the people commenting on the size I say this: the Galaxy S4, while having a larger screen than its predecessor the S3 it is actually a tad smaller than the S3. Expect the same from the Note 3 as it will be the same size or slightly smaller than the Note 2. One thing Samsung better do is have a more refined and smooth version of Touchwiz than the train wreck they put on the slow laggy over bloated S4. They are smart and probably realize they made some mistakes with the S4 and will have them all corrected for the Note 3, at least they better hope they do. Yeah my original Note only has the 5.3″ screen, but the phone is actually 6.25″ corner to corner. Lots of room to increase screen size while maintaining or reducing the size of the actual phone. N3 better have at least 5.9″ screen, or else I may have to check out the mega. “You sound pretty clueless without any doubt.” Says the moron who “knew” the US S4 would have the Exynos 5 Octa, 3GB of RAM, wireless charging, and “a pad” on the device to measure blood pressure/blood glucose levels. “This is the ultimate business productivity device” No, it isn’t. That title goes to a laptop, or a netbook, or even a tablet. I agree he’s an idiot and the ultimate hype master, but there’s no denying the impact the Note 3 and other similar sized devices such as a Nokia Windows 8 phablet and 5.7 inch IPhone will have on business types/travelling entrepreneurs. I sound pretty clueless huh skippy? What I was saying was “IF” they increase the size to almost 6″ they will alienate female buyers from buying it as an everyday phone. Business women will stick to an actual tablet at that point. Makes sense right?? Understand what your reading before you try to be funny with a comment…. To do more the screen definitely has to be bigger, an increase in size to 5.9 inches is still not enough, the ideal bare minimum should be the original rumoured size of 6.3 inches, which we know is the Galaxy Mega. The mega series is a preview of the Note 3’s size to see how people would react to it, I believe Samsung have 2 prototypes, the 5.99 which equals to 6 inches or the 6.3 inch screen size which we have seen in very recent leaks in disguise. note 3 could be 6 inch but the physical size will be just a tad bigger or smaller depending on the amount of reduced bezel. No doubt the Galaxy Note 3 will be the BEST DEVICE to purchase in October. Samsung is the leader in this category they made prominent everyone else are the rookies and followers. Expect 32gb internal memory on top of the expected 64gb sdxc class 10 card. Exceptance of 128gb card would definitely be outstanding. 4200mAh battery will be in tow since the Huawei Assend Mate created the standard earlier this year with it’s 4050mAh battery Samsung will blow past that. Expect new Spen features, New multi window features, as well as a new host of software solutions along with android 4.2.2 or 4.3. Either way the Note 3 is the proven product with the BEST track record over anyother expected phablet in 2013. It’s definitely a day one purchase for me just as the current Galaxy Note 2 was. To be honest with you, im not really interested in anything Samsung are doing at this moment in time with new phones i believe that first they should update their old phones, namely the Samsung galaxy s3 to 4.2.2, i know this is a business and it’s all about money, but when a person spends alot of their hard earned money on a phone then they have a right to have it updated. Could always just root the thing and put in the update yourself? I would do if I knew how to do it without messing my phone up,to be honest with you I don’t know how you do it and im worried about not doing something right. Make sure there are several comments made by people that successfully used whatever method you are going to use. And don’t be afraid to write people in the forums that did it. Also, the phones binary count will go up. It’s how they know you modded the phone. So if you can live with losing your warranty or you are confident enough to attempt a binary count reset then you should look into the rooting option if you don’t wish to purchase a new phone. Wish you the best of luck and always make sure steps! wish you the best of luck! blah blah sorry I can’t understand your carabao english. poor guy. he got money for gadgets but nothing for his improvement. Might be able to spend money on improving our English but no money can keep someone (you) from being an a__hole… That takes quality upbringing, not inbreeding. Why don’t you start by responding to people’s point (his is obvious), vs making douchbag comments about their language. People skills 101….moron. Look at it this way, if you phone lasts a year, then its probably not a manufacturing fault that would warrant a replacement. Buy a ph with standard warranty (1year), then learn to root. I have a sgs3, and once the warranty was up, I rooted and put a new kernel + bootloader. I use my private phone everyday for work E-mails on top of my work’s sgs2 (awesome for searching and answering e-mails btw), and I still got 70% left on my batt. Im not kidding, the work that some developers do for these phones is mind blowing. There’s loads of resources on xda. Seek and you shall find. Another tip for battery life, don’t let kids use you’re phone. Its been proven that they have the ability to drain any type of battery. As for the materials used for the note3 goes, I always have a rubber case on my phones so it doesn’t bother me if the backs of them are plastic. You make a great point. But we all know they want that extra push of updated software to entice you to upgrade your phone. It’s sad they act that way. The real down side is voiding your warranty for rooting and updating the ROM yourself. i feel ya but again like you said business why get a new phone when you have an old phone that has the same software as the iphne infinity or galaxy s ? Navigation in the rain, texts and calls in bad weather, coffee spills at the table, … At this point of the market we should be starting to see IP (ingress protection) as standard, certainly at the high end. I like the idea of the Note 3 but I’ll be looking for water resistance migrating from the Experia Z, Motorola Razr HD, Galaxy Active and others, …..
That would be awesome to release that version as an alternate model at initial launch. Cause the S4 Active looks like a winner to me. Some people are upset that they jumped on the original S4 already. Funny how people stopped caring if they get wet when it starts raining. They only protect their phones. sell all your gadgets and get an english tutor for crying out loud. funny how people spend all their money on these things yet they don’t want to invest on something that will improve them. But I can learn so much more from a smartphone… It only matters how you use it. I would want the note 3 to be metal. The plastic is just so cheap looking and also very fragile. I hope they listen to its faithful customers. i agree.. even if not metal, a nice quality solid material would do, I am patiently waiting for the note 3. It will be an awesome device. Metal & glass do look better but once you put a case on that $600 phone does it matter anymore? Also, plastic is better for withstanding drops and mass production. I would love to have Snaps 800 heartbeat, min 2 gb ram, 32+gb storage, 1080 screen cica 6.0 inches, 16 mp camera with optical stability, and a suitable battery to allow 2 days of Hardish use, metal or plastic body ( not particularly bothered as my sgs3 has been brilliant ). Should come in 32 & 64GB with expandable memory. Also it’s time to step it up to 3GB RAM and not waste a large chunk of it on BG processes and Bloat. When my N2 was new without any app installs on my part, had .9 of the available 1.7GB of RAM in use already. And clearing the memory is only temporary. It just restarts the processes. I predict 5.85 on the screen size considering the jump for S3 to S4 was .35 while maintaining the same form size. One thing that should also be mandatory is the **brightness nits**. Yes this has been an issue for too long. I have owned the S2, S3 and N2 and they are all hard to see in outdoor sunlight. Supposedly the Amoled screen will get burn in after 6 months. So that may be why. But the majority of Note users aren’t children and I would rather be responsible for keeping the brightness down manually with the option to increase it for better outdoor visibility. I have heard rumors that there will be different tech for the screen. We’ll see I guess. Cause the S4 may have a better looking screen but still suffers in direct sunlight. And as far as the mega pixels for the camera, I am content with 8. The higher MPs don’t mean the photo quality is better. A crappy 100 megapixel camera will just shoot over sized blurry images. I did hear that the lens will be of better quality made by Sony. Again, we will see. Not as a single stick to date. But a RAM upgrade in any amount would be a big plus. I thought if you set it to automatic brightness then the screen will adjust to sunlight. My S2 doesn’t change or flicker after I changed the ROM tho. Screen size should remain the same as that of Note 2 I reckon please. OMG! OMG!! OMG!!! WAITING YOU NOTE 3 COME SOON CANT WAIT HERE COME THE FATHER OF SMARTPHONE I LOVE U NOTE 3 WAITING U………. I was looking a the S4 today and had considered buying it. But I really hope the N3 comes out within a couple months. The Verizon guy said there aren’t any expected releases til probably December. But I doubt Samsung tells them much anyway. They should let us install apps on the extSDcard for the next note, or give it 32gigs or ram atleast. My current SD card is half full, yet internal memory already 90% used and I cannot move stuff to SD with S3 or Note2. Root your phone then move whatever apps to the external sd. It’s quite simple. You can also partition the external to make it like the internal, but I prefer rooting. Oh, my. This writer seriously needs an editor. Make it damn water proof incase of accidents. Note 1 and jelly bean big lag. Option 2 change search engines if desired.